Last year American rockers Every Mother’s Nightmare (EMN) released “Grind”, their first album in fifteen years, and founding-member, singer Rick Ruhl was my guest on the Friday NI Rocks Show. 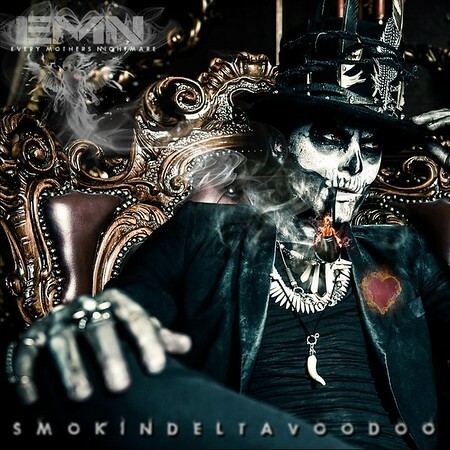 EMN have now re-released their third album “Smokin Delta Voodoo” which initially appeared in 2000. The new re-packaged and re-engineered version of the album was released on 8th June via HighVol Music and includes four additional demo tracks. I’ve played tracks from the original version on the Shows many times over the past 8 years and the new version of “Delta Voodoo” was featured on the Friday NI Rocks Show on 15th June. EMN formed in Memphis in 1987 and made their breakthrough with their self-titled debut album which was released via Arista Records in 1990. That album included their best known tracks “Walls Come Down” and “Love Can Make You Blind”. The follow-up album “Wake Up Screaming” was released in1993, again via Arista. The changing rock scene meant that their third album “Smokin Delta Voodoo” didn’t appear until 2000. That album plus two further albums in 2001 and 2002 were released via Perris Records. There was then a gap during which the band continued to perform but did not release any new music, until 2015 when the EP “Grind” appeared. Singer Rick Ruhl was my guest on the Friday NI Rocks Show in September 2017 just ahead of the release of the album “Grind” – http://www.rockradioni.co.uk/interviews/3195-ni-rocks-interview-with-rick-ruhl-from-every-mothers-nightmare.html – and talked about the history of the band and future plans. The current line-up features Rick Ruhl on vocals, John Guttery and Travis ‘Gunner’ Butler on guitars, Jim Phipps on drums and Troy Fleming on bass. When “Smokin Delta Voodoo” was first released in 2000 the line-up featured Rick Ruhl on vocals, Troy Fleming on bass Jeff Caughron and Travis Hall on guitars and Kris ‘Newt’ Beavers on drums. The re-released album has been re-packaged with a great new cover, includes four raw demo tracks and has been re-engineered by Anthony Focx.